†Prices are per person, include Guarantee rates, based on double occupancy in an inside stateroom, in U.S. dollars, applicable to select sailings and subject to change. With all bookings made under Guarantee rates, stateroom assignment is subject to Norwegian Cruise Line discretion and can be assigned at any time up to day of sailing. Reduced Deposits: Haven, Suite & Concierge categories are not applicable for this offer. Offer is only applicable for mini-suites and below. Offer is for new individual FIT reservations and new group delegates booked outside of finalization. Ship’s Registry: Bahamas and United States of America. You are not a tourist. You're a tropics trekking memory maker. Kayak Friar's Bay in St. Kitts. Roam the ruins of 18th century garrisons in St. Lucia. And maximize your vacation with up to $400 to spend at sea when you book during our Cyber Weekend Sale. Ask your travel agent for more ways to save big. Come Seek the Royal Caribbean®. *See your Travel Professional for complete offer terms. Non-refundable deposit booking ("NRDB") cancelled prior to final payment due date will receive a future cruise credit in the amount of the deposit minus a $100 per person service fee ("FCC"). FCC is non-transferable and expires after 12-months from issue date. $100 per person service fee applies to changes to NRDB ship or sail date. Deposits made toward Guarantees and Grand Suites and higher categories are non-refundable and are subject to NRD Booking Terms. Cruise must be booked between 11/24/17 through 11/27/17 11:59 p.m. EST the "Offer Period". Offer applies to sailings departing on or after 12/24/17. Offer includes 50% off cruise fare of second guest who must be booked in the same stateroom as a first guest who books at full fare ("BOGO"). Kids Sail for Less includes 25% cruise fare savings for 3rd guests and higher booked in the same stateroom as the first two qualifying guests. Deck the Holidays Deals offer provides onboard credit for guests who book a holiday sailing departing from 12/19/17 through 12/31/17 and 12/18/18 through 12/31/18. Offer includes an onboard credit determined by category booked and sailing length: $25 to spend onboard for Interior and Ocean View on sailings 5 nights or less, $50 to spend onboard for Balcony and Suite on sailings 5 nights and less, $50 to spend onboard for Interior and Ocean View on sailings 6 nights and longer and $100 to spend onboard for Balcony and $150 to spend onboard for Suites on sailings 6 nights or longer. Additionally, Black Friday/Cyber Monday Sale provides onboard credit determined by category booked and sailing length: $50 to spend onboard for Interior and Ocean View on sailings 5 nights or less, $100 to spend onboard for Balconies and $150 to spend onboard for Suites on sailings 5 nights and less, $75 to spend onboard for Interior and Ocean View on sailings 6 nights and longer, $200 to spend onboard for Balconies on sailings 6 nights or longer, and $300 to spend onboard for Suites on sailings 6 nights or longer. Deck the Holidays and Black Friday/Cyber Monday Sale offers exclude China departures. NRDB that are booked six months or more prior to the cruise departure date are eligible to receive a per stateroom onboard credit ("OBC") in the following amount: for sailings 5-nights and less, $25 OBC for Interior and Ocean View, and $50 OBC for Balcony and Suite; and for sailings of 6-nights and longer, $50 OBC for Interior and Ocean View, $100 OBC for Balcony and Suite. OBC is in USD, has no cash value, is non-transferable, not redeemable for cash, and will expire if not used by 10:00 p.m. on the last evening of the cruise. Offer is combinable with select promotions. Offer applies to new, individual and named group bookings confirmed at prevailing rates. OBC is not redeemable for cash and may expire. Offer open to residents of U.S. or Canada. Offer excludes China departures. Prices and Offer are subject to availability and change without notice, capacity controlled, and may be withdrawn at any time. Refer to www.RoyalCaribbean.com for complete terms and conditions. Sure, you could wait out in the cold at 6 a.m. for Black Friday, or you could be in bed dreaming of your next Club Med all-inclusive vacation. *BOGO: Stay for up to 50% off in a Club category room select weeks at Cancun Yucatan, Mexico; Ixtapa Pacific, Mexico; Sandpiper Bay, FL; Columbus Isle, Bahamas; Turkoise, Turks & Caicos and Punta Cana, Dominican Republic. Prices on other dates and/or at other resorts may vary. Blackout dates apply. Offer requires a 3-night minimum purchase, all nights booked under this promotion must be taken consecutively. For Columbus Isle, offer is limited to a 7-night stay and must be booked with air. Valid for new individual bookings only at select resorts for select travel dates with check-in on or after 11/25/2017 and check-out on or before 5/5/2018 and must be booked between 11/21/17 and 11/27/17. Offer is subject to capacity control and may increase at any time. General Conditions: Blackout dates apply, including holidays and other dates. For Turkoise all guests must be 18 and older. Guests at Columbus Isle must be 2 and older. Club Med Membership fees of $60 per adult and $30 per child are additional. Other restrictions apply including brochure terms and cancellation/change fees. Not responsible for errors or omissions. Void where prohibited or restricted by law. CST#: 2020955-50. Kick-off the holiday season with Black Friday deals on Caribbean cruises. Sail on the revolutionary MSC Seaside or ultramodern MSC Divina and experience world-class entertainment, authentic cuisine and so much more, all while cruising to some of the most stunning Caribbean destinations such as Antigua and Barbuda, Jamaica and U.S. Virgin Islands! Book a cruise between November 20 - 29, to take advantage of our Black Friday Upgrade Event where you can book a Balcony stateroom at the same price as an Ocean View stateroom! There will be no other chance for you to book this deeply discounted rate on an MSC Seaside or MSC Divina cruise! Sailings included with this free upgrade event are select 7-night Caribbean cruises on MSC Seaside and select 10 & 11-night Caribbean cruises on MSC Divina. 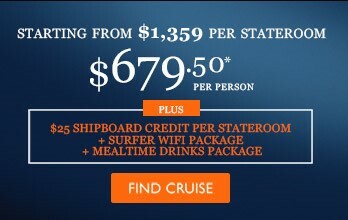 Rates are cruise only per person based on double occupancy and quoted in USD. Offer valid for new bookings only for U.S. & Canadian residents. Government taxes and fees (GFT) are additional for each guest. COMBINABLE DISCOUNTS: One (1) of the following discounts may be applied as applicable per stateroom: MSC Voyagers Club Discount; Military Discount; Interline Discount. Applicable to active and retired U.S. and Canadian military, civil service and interline personnel and their spouses, dependent children, parents, and parents-in-law. Qualifying guests must present an I.D.badge from their respective organization at time of booking. Offer is capacity-controlled, subject to availability, cannot be combined with any other discount or promotion and may be withdrawn without notice. MSC Cruises reserves the right to pass on any fuel surcharge without prior notice to all guests. MSC Cruises reserves the right to refuse to honor any prices/sailings that are erroneously printed or quoted. Other restrictions may apply. Ask for “Black Friday” when booking. Offer Expires: November 29, 2017. Ships’ registry: Panama and Malta. Who needs to wait for Black Friday to plan the perfect get away? Not Enjoy Vacationing clients. The deals have already started! We're sharing some of them below but if you are looking for something not listed, just let us know! We'll be updating the page all week so keep an eye out! Save up to $150 on top of already great package prices for travel to the Hawaiian Islands. Terms and Conditions apply to all offers. Contact Enjoy Vacationing at 608-347-8574 for details. AM Resorts, featuring Zoetry, Secrets, Dreams, Breathless, Sunscape and Now, is offering pricing starting at $65 per night for their all-inclusive resorts in Mexico and the Caribbean starting at Midnight Friday morning. Availability is limited so act quickly! Terms & Conditions: The Black Friday Sale is valid on all new reservations at participating resorts made from 12:00 AM EST on Friday, November 25, 2016 through 11:59 PM EST on Sunday, November 27, 2016 for travel from January 2, 2017 to April 30, 2017. The Black Friday Sale offers rates starting at $65 USD per person, per night based on double occupancy. This promotion is not combinable with the Groups, Gatherings and Getaways promotion and is not applicable to groups bookings. Starting from rate varies by resort and is based on land-only reservations. Starting from rate is not reflective of the price for the entire travel period. Entire promotion is subject to availability and can be modified or closed at any time. Blackout dates and holiday restrictions may apply. Employees of wholesalers or tour operators do not qualify. Valid for all markets. Bookings made on this promotion are non-refundable. Limited rooms available. Black Friday is back and this year we’re offering discounts of up to 60% on your upcoming stays, so start booking now and get ready to enjoy some well-deserved vacations on your favorite beaches.